In the late 1940s and early 50s, Edward Sargent, known by all the locals as Ted, ran a greengrocery round in the Benfleet area. The business operated from the family home at 44 Melcombe Road. 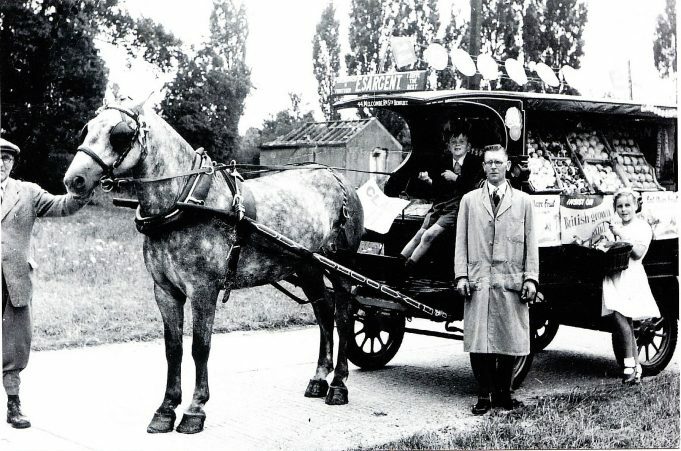 Ted was ably assisted by his family and in the first picture above he can be seen in his greengrocer’s overall with his father Harry holding the horse, his son John sitting on the cart holding the reins and daughter Margaret holding the basket. Ted’s round included many of the local roads and at this time a large proportion were little more than unmade tracks. 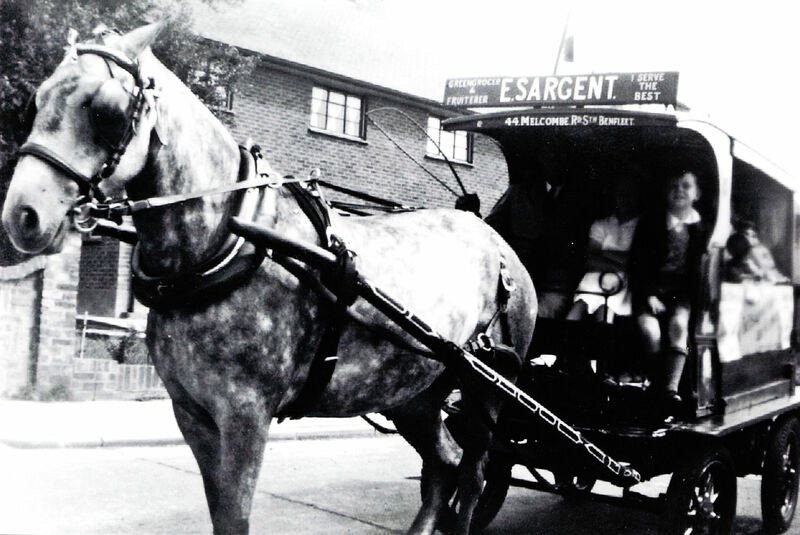 The second photo of the horse and cart was taken outside the family home in Melcombe Road. 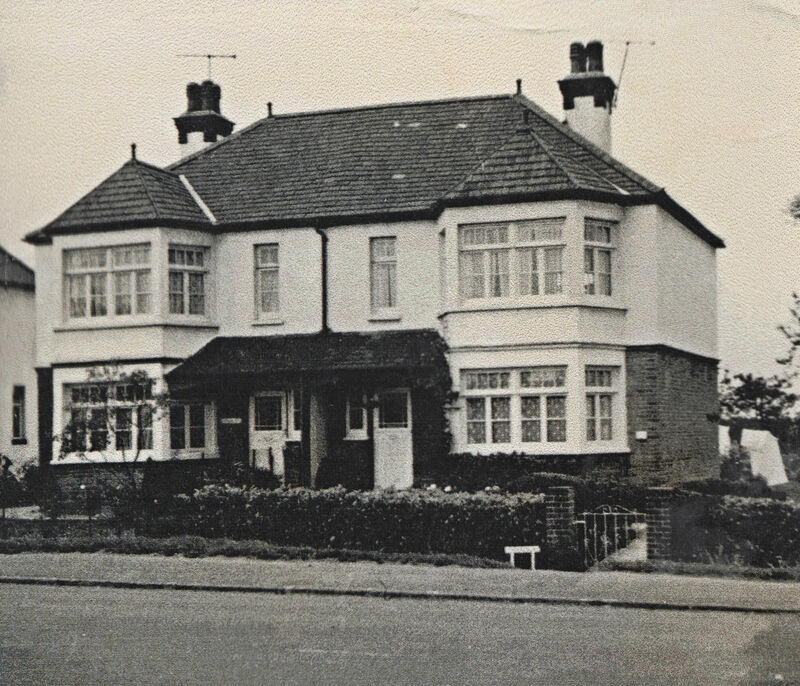 The last photo shows ‘Sadlers Villa’ which is located on the north side of the London Road, to the east of Sadlers Farm. The house belonged to Margaret’s grandparents and Margaret recalls spending many happy hours as a child playing in the very large garden of the property. I used to help Ted on his rounds in the early 50’s. One place that stands out to me is when we used to stop at the ‘Blacksmiths’ which is now the ‘Five Bell’s P/H’, Basildon. Whilst walking my dog on the Elmhurst Road Field I found to the righthand side of the field near the alotments what looks like foundations of a house I presume is the house above. The garden was exactly as you described and had a huge man made pond would this possibly be the same house, I guess if the house was still standing the entrance would be opposite the roundabout i.e. Sadlers Farm. Regarding your comment Eleni, the foundations that you stumbled upon during your walk are definitely not to do with this property. ‘Sadlers Villa’ still stands today and is not near the area you described. However, if you take a look at the London Road, A13 at Sadlers Farm on the Benfleet side of the roundabout you will see a row of older style properties, of which this is one.